This office has been around for a long time since 1944 to be precise. Rodgers & Hammerstein were the biggest force on Broadway when Broadway was the biggest force in popular entertainment. They produced plays, musicals, concerts and revivals. They presided over Broadway runs, London transfers, national tours and major motion pictures frequently all at once. They held onto everything they could, and controlled their own destinies. They were lionized and they were envied. And they kept their perspective. We may be big, Richard Rodgers once said. But were not U.S. Steel. Richard Rodgers & Oscar Hammerstein II backstage during rehersals for Oklahoma!, Spring 1943. In 1942, Rodgers and Hammerstein began writing together under the auspices of the Theatre Guild; their assignment was to make a musical out of the Guilds play, GREEN GROW THE LIACS. With the bold artistic strides he and Hammerstein were making on the score for what would become OKLAHOMA!, Rodgers had a bold business notion too. Wed be suckers, he told Hammerstein, if we didnt publish it ourselves. Other songwriters had been their own music publishers before (Irving Berlin being a prime example and stellar success), but with OKLAHOMA!, R&H were seeking to set a system in place that would protect and nurture their works and those of others for decades to come. With Williamson Music up and running, R&H had further ambitions to fulfill: controlling their own songs was one thing, but controlling an entire production was another. R&H decided that it was time they become Broadway producers. Though unprecedented, this career move had a certain logic. Between them, R&H had decades of experience in theatrical production, learned by osmosis and observation. Hammerstein was born into the third generation of a theatrical impresario dynasty; he knew well the legends and lore of his remarkable namesake and grandfather Oscar I, and he had watched closely as more than a dozen of his own musicals were produced by his uncle, Arthur Hammerstein. Rodgers, meanwhile, had soaked up every detail of production during his collaborating years with Lorenz Hart. He had a knack for the business from the start, and that fascination only grew. With such musicals as ID RATHER BE RIGHT, BABES IN ARMS and PAL JOEY Rodgers learned production from some of the best, including such gentlemen of the trade as Sam Harris, Dwight Deere Wiman and George Abbott. In 1942, Rodgers co-produced a musical with Abbott, BEST FOOT FORWARD, that he had not even written (save for one unattributed number). Later that same year, he shared producer billing with Wiman on the last new Rodgers & Hart musical, BY JUPITER. In addition to I REMEMBER MAMA, R&H presented several more plays, including HAPPY BIRTHDAY (1946), a comedy by Anita Loos and starring Helen Hayes (which featured I Havent Got a Worry in the World, a comedy number written for its star by her producers); JOHN LOVES MARY (1947) by Norman Krasna; THE HAPPY TIME (1950) by Samuel Taylor (the play would later become the basis for a musical by Kander & Ebb, while Taylor himself would go onto write the book for Rodgers NO STRINGS); THE HEART OF THE MAITER by Grahame Greene (1950); and BURNING BRIGHT (1950) by John Steinbeck. The Greene closed out of town in Boston, the Steinbeck was a quick flop on Broadway, but the other plays were smash hits courtesy of R&H. The R&H office flourished. By 1956 it had moved to 488 Madison Avenue (where Williamson Music was ensconced), occupying a suite of ten rooms. The staff, having grown to over a dozen, included a General Manager, a Press Representative, a Casting Director a Librarian, along with the requisite corps of assistants and clerks. Stage and movie productions required supervision; publishing deals, recording contracts and actors terms were in constant negotiation. Ongoing properties were maintained at high standards; new projects were being developed, or pursued. Richard Rodgers & Oscar Hammerstein II working on the score of South Pacific, 1949. Third, that Rodgers loved to micro- manage the staff while Hammerstein was all too happy to stay out of their way...Well, that story may have been true. From SOME ENCHANTED EVENINGS (1955), Deems Taylors contemporary account of R&H: The one place to which [Hammerstein] never goes, if he can possibly avoid it, is the Rodgers and Hammerstein office on Madison Avenue, which he regards with simple loathing. This is Rodgers domain. What with guiding the fortunes of their musical plays, to say nothing of their activities as play producers, Rodgers and Hammerstein are decidedly Big Business. And Rodgers takes an active hand in that business whenever he is in New York... Even when he is not actually in the office he keeps in constant touch, telephoning in, or leaving telephone numbers where he can be found at any hour. All this leaves Hammerstein a little wide-eyed, his conclusion being that he must like it, or he wouldnt be doing it. A key factor in their success was unity. Whatever disputes or disagreements Rodgers and Hammerstein may have had with each other; they kept to themselves. Strategies and priorities were thrashed out behind closed doors, and when they emerged, the duo spoke as one. This single persona was carefully cultivated through public appearances, which were frequent, rarely was either man celebrated without the other. With extraordinary foresight, R&H knew that public relations was a vital part of running a business. They were early and frequent guests on THE ED SULLIVAN SHOW. They were profiled in Time, Life and Collier's. They were interviewed by Edward R. Murrow, skewered by Groucho Marx, feted by President Eisenhower. They were even a plot device on I LOVE LUCY. Like their compatriot, Walt Disney, R&H recognized that their public profile was a self-endorsement of their product, and they strove constantly to maintain the joint iconic status their works had given them. Rodgers especially, wrote Frederick Nolan in THE SOUND OF THEIR MUSIC (1978) felt that the name of Rodgers and Hammerstein should be kept constantly in front of the public; that it would help to sell tickets. To that end, he and Oscar became the most available composer and lyricist in theatrical history. This courtship of the press had other benefits too; though agents and performers who faced off against R&H (or their brilliant lawyer Howard Reinheimer) may have had war stories about their fierce bargaining tactics, the public image belied the gossip. When Cleveland Amory profiled the team in a February 1959 issue of Holiday Magazine, his headline called them, The Nicest Guys in Show Business. By the time that article appeared, Rodgers had been a solo act for 16 years, since the death of Oscar Hammerstein in August of 1960. He continued to write at a fairly impressive clip, from the TV documentary score for WINSTON CHURCHILL: THE VALIANT YEARS and extra songs for the movie remake of STATE FAIR and the film version of THESOUND OF MUSIC, to Broadway and TV scores written with himself (NO STRINGS, ANDROCLES AND THE LION), Stephen Sondheim (DO I HEARAWALTZ? ), Martin Chamin (TWO BY TWO) and Sheldon Harnick (REX). In 1962 he took on the role of president and producing director of a new entity, the Music Theatre of Lincoln Center at the New York State Theatre, presiding over a series of opulently-mounted revivals several of which were from his own canon. In addition, the fruitful legacy of his forty respective years with Hart and Hammerstein continued to bloom: young Rodgers and Hart shows from the 20s and 30s, and vintage Rodgers and Hammerstein musicals from the 40s and 50s, were revived with increasing frequency. 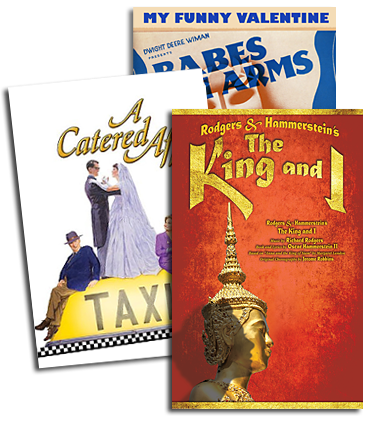 As sole owners and publishers of their own work, R&H were also the first to see the gold glistening in their musicals stock and amateur potential. As soon as was decently possible, after Broadway and initial road tours had laid the groundwork, R&H began licensing their properties to the summer stock and now-vanished summer tent circuit, as well as to schools, community groups, and summer camps. What Gilbert & Sullivan chestnuts and American operetta staples were to the pre-WWII era, the R&H musicals were to become for the 50s, 60s and (happily) every decade since. Though there were several respectable licensing houses eager and available to handle the ever-growing R&H catalogue, the duo did not hesitate to keep this latest adjunct of their portfolio where they kept everything else: in-house. Richard Rodgers & Oscar Hammerstein II circa 1949. Photo by John Swope. Richard Rodgers & Oscar Hammerstein II under the marquee for The King and I (1951). And then, on December 30, 1979, at his home in New York City Richard Rodgers died at the age of 77. With an efficiency that he would have appreciated, however, the R&H office kept going. In early 1980, it was announced that Richard Lewine a longtime friend and associate of both Rodgers and Hammersteins would take over the management of the business. Its important that someone with a full appreciation of the artistry of Rodgers and Hammerstein oversees the licensing of their work, Lewine told the New York Times, adding, Ive agreed to supervise all the enterprises owned by the estates for two years. In May of 1981, the Rodgers and Hammerstein families brought in a young man to be groomed as Lewines successor. His name was Ted Chapin. No longer a producing entity R&H has emerged as a proactive rights-holding agency, representing dozens of writers and musicals, encompassing the past, present and future and all the while holding to the mantra of our founders: nurture the writer, and protect the copyright. Ted Chapin has served R&H for over 30 years; Rodgers and Hammerstein thought outside the box, so we try to do that too, Chapin observes. They took risks, so we take risks. Our goal is to build on the incredible legacy of these two extraordinary men.